← Who is thankful for you? What masks do you wear to hide your authentic self? I’m not talking about the roles we fill — doing work, raising children, being a spouse, a friend, or a member of the choir. What person are we as we perform the roles of our life? Are we the same authentic person as God made us? Or do we wear different masks in different situations? Do you wear a work mask? A mask for your spouse? 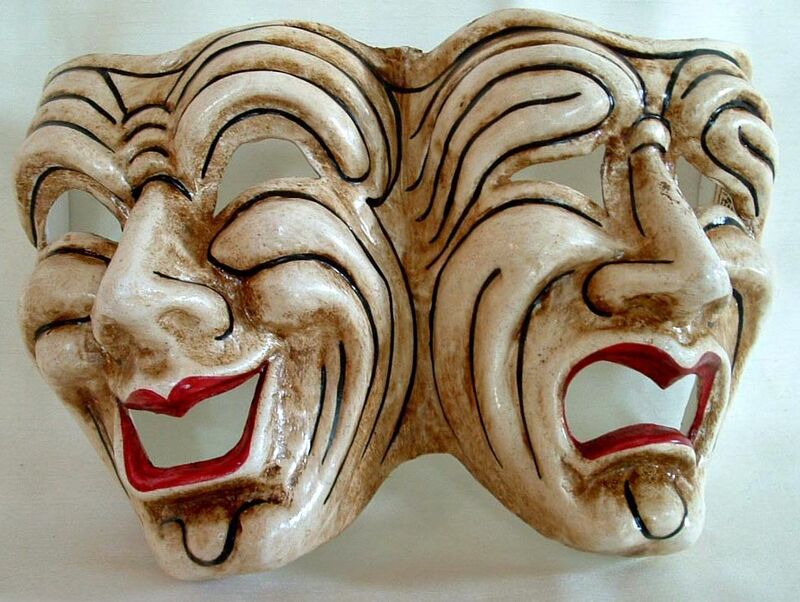 Do you have different masks for your roles as church member, employee, boss, customer? I still remember a teacher when I was seven years-old, who smiled and laughed at a co-worker, and then turned an icy, hateful countenance towards the students. Some of us wear masks around most of the world, and then take the masks off when we blow off steam with old, trusted friends. Who are we the rest of the time? All families subconsciously assign roles to family members; each member of the family is expected to wear a mask that corresponds to family expectations. Year after year, you spend holiday time with family — where five or six people help you shoulder the mask they expect you to wear. Families are thrown into chaos when a member chooses to wear a different mask or assume a different role. Pressure from family and friends can make it painfully difficult to take off a mask. It can be dispiriting to wear different masks for different roles in your life, the real you only slipping through in moments of happiness or sorrow. We get buried under a lifetime of expectations, and masks become nearly impossible to remove — so ingrained they are normal, despite the damage they do. It’s exhausting pretending to be the person in the mask. But we don’t know why we’re exhausted. We seek ‘self-care’ in massages, oils, food, alcohol, television, sports and anything else that keeps us from taking off the mask and looking at the face in the mirror. Most can’t stand the thought of actually being honest with themselves. Honesty with those around them is impossible. We are trapped in our masks, our lives little more than theater, as we pretend to be what’s expected, and our true selves grow smaller and isolated. This is not the will of God. God wants us to have life, and have it abundantly. We are created in the spiritual image of God – loved and loving. Born to grow in love and extend love. With great energy, and sometimes with special support of loved ones, masks can be removed, and we can live as God intended. Open and receptive to the energy of God and of those around us. Growth only comes when ground is broken. When masks are shattered. We don’t improve or grow by remaining the same. We improve by outgrowing our masks. “He not busy being born is busy dying,” Bob Dylan, said. “Do not be conformed to this world but be transformed by the renewing of your minds, so that you may discern what is the good and acceptable and perfect will of God,” Paul wrote to the church in Rome. This entry was posted in culture, Faith, Uncategorized and tagged Bob Dylan, family genogram, Family systems theory, masks, Romans 8. Bookmark the permalink.